My family moved to Lochcarron in 1999 after a very tough time. We’d been living in Shetland and that hadn’t worked out for us, so we had to move back to the mainland. Thanks to the help of some very good friends we found the house in which we still live and we moved in at the beginning of March of that year. At the time we were just glad to have somewhere to stay, somewhere that we could make into a home. The house needed a lot of work and we didn’t have much money, my husband had to work away quite a lot and my children, who were five and seven at the time, had to start a new school. It was a pretty traumatic time for us all. We were newcomers, moving into a small West Coast community, we might have found it hard, we might have struggled, but people were very welcoming and we quickly made a home. I don’t remember what I thought back then about future plans, we just wanted somewhere to settle for a while, I don’t know whether I had thoughts about staying for longer than a few years, but here we are almost twenty years later. Lochcarron has welcomed us, sheltered us and given my children space to grow into the wonderful adults they have become. Like everyone that one loves, I have had my differences with the village over the years. Lochcarron is a long way from just about everywhere (or maybe just about everywhere is a long way from here!). It was hard when my husband had to work away. It was hard when family were ill or when my children were going through hard times and when they grew up and moved away. It was difficult when we had little money and the house was cold and drafty and needed new windows and doors. But there were also so many rewards. 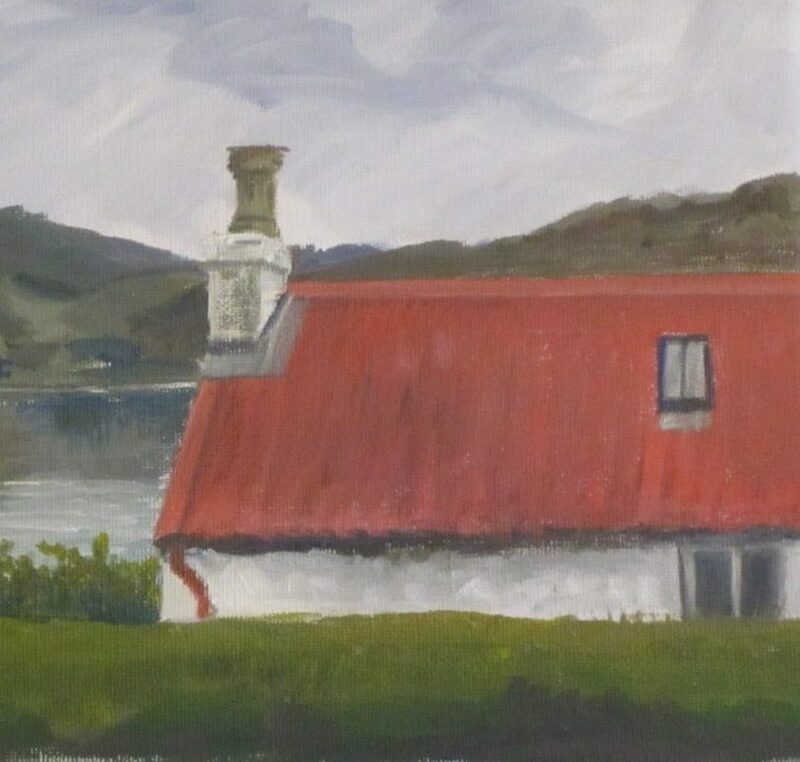 Lochcarron, indeed the whole of Wester Ross is stunningly beautiful, for a landscape artist it is a wonderful place to live. It is beautiful in any weather and sometimes, it so amazingly gorgeous that it takes your breath away. Lochcarron has so many of the things that one would need in a small village, a great surgery, a golf club, library, an excellent shop, a shop and garage, two other garages, great cafes and restaurants, gift shops and The Howard Doris Centre. But the best thing, the most important thing is the people. We have some wonderful friends and neighbours. For some years I worked in the village, then I worked in Inverness and Balmacara, so I sort of drifted in and out of village activities and events, but was always made welcome when I did make it along to things. Whenever I’ve had a problem or needed some help, someone locally has always been there for me. So I wanted to say thank you. I wanted to commemorate those twenty years somehow, so I’ve been doing some paintings of local views and I decided to upload them to my Etsy shop for a very low price of only £20 each (plus p+p) as a special, anniversary, introductory offer. I have sold to people who have contacted me directly via social media for a while, and I’ve also had a Fine Art America account, but this feels very different! It took me a while to read through terms and conditions, get parcels weighed and sizes sorted, (thanks to the lovely Hilary at the post office for the advice!) to get everything mounted and presented nicely, oh yes, and to paint the landscapes themselves! I’ve spent time adding social media buttons, info about the painting, info about me and getting ridiculously excited and nervous. But there it is (or at least a screenshot of it!) my first ever listing on my Etsy shop. It will fill up over the next few days as I add more paintings. Hopefully these paintings communicate some of my feelings of home, some of the joy and wonderment that I feel when I see these stunningly beautiful, familiar and iconic places. Lochcarron has become very special to us both, we feel blessed to have a comfortable home and lovely garden, we feel blessed to have such wonderful friends and neighbours and for me, someone who was mostly rootless for much of my childhood it has been wonderful to finally find a place to stop for a while. I feel connected here, and to the Highlands in a way that I had never been before. I do love to travel, but when we come back to the Highlands after being away, my heart leaps with happiness as we first catch sight of the Kessock Bridge in Inverness. With each mile we travel West I feel a lightness of being, then finally when we drive up the hill at Balnacra and see the hills of Lochcarron I know that I am home. We were so hoping to get back to Lochcarron this year, but work has got in the way. Hopefully we’ll manage a return visit in 2020 – the place certainly took our breath away.